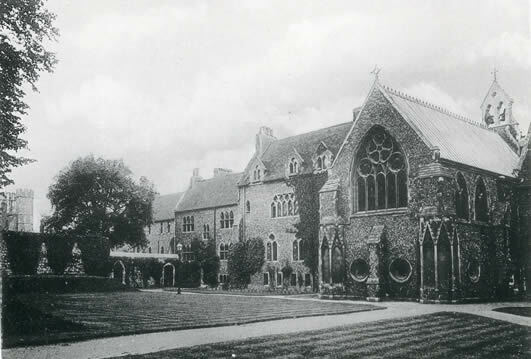 Broughton was one of the two original boys’ houses when the School acquired the St Augustine’s site in 1976. Girls were attached to the house from 1978. Broughton became the School’s fourth girls’ boarding house in 1993. The main part of the building was originally built by William Butterfield in 1848 as the Warden’s lodgings for St Augustine’s College. Next to this was the fellows’ building and – a later addition – the ‘natives’ building’. To the right are the Upper Chapel, used by the School, and the Lower Chapel, with memorials to missionaries from the College. The chapels were also built by Butterfield, on the site of the medieval guests’ chapel. Housemasters and housemistresses: Michael Hodgson (1976-88), Stephen Graham (1988-93), Pat Wakeham (1993-2005), Amelia Arvidsson (2005-10), Catherine Shearer (2010-18), Doreen McVeigh (2018- ).